Foreclosure lawyers at Consumer Action Law Group offers legal solutions to stop the foreclosure process. They have offered many methods to California homeowners on how to stop a foreclosure. There are still many homeowners in the States of California that are facing foreclosure. Whether these homeowners are in the early stage of foreclosure or have already received a notice of default or notice of sale, there is hope for those who want to stop the foreclosure process and save the home. When receiving a notice of default or notice of trustee sale, homeowners have the best chance of saving their home when they contact foreclosure lawyers for assistance to stop the foreclosure process. In most cases, foreclosure attorneys can help homeowners to stop foreclosure and save their property. Filing a lawsuit: This is a very effective way to stop foreclosure. Many people avoid filing a lawsuit because they think that their lender help them. In fact, filing a lawsuit is a wise choice when the lender promises to help and simultaneously moves forward with the foreclosure process [a common practice called dual tracking – which is illegal]. A strong foreclosure lawyer can fight to negotiate for the borrower’s rights. If the homeowner files a lawsuit, they can usually remain in their property. If the lender violates the right of the borrower or commits fraud, a foreclosure attorney can defend the borrower in the court. Getting a temporary restraining order: After filing a lawsuit, many homeowners are entitled to a temporary restraining order from the court. To obtain a temporary restraining order, homeowners have to convince the judge about the effect of “irreparable harm” if the foreclosure continues. The lenders will be ordered to stop the sale if the judge grants the temporary restraining order. Filing a lis pendens: Lis a pendens means that a pending lawsuit can affect the title of the property in dispute. So, a new buyer of the property will also become aware of the lawsuit and the property dispute while the lawsuit is proceeding. Filing for bankruptcy: This option is usually the last resort after all options are exhausted. Bankruptcy immediately stops the foreclosure and makes it possible for the homeowner to keep the property. There are additional benefits for filing bankruptcy such as discharge from debts and stopping all collections. When filing bankruptcy to stop a foreclosure, homeowners are strongly advised to get experienced legal counsel such as foreclosure attorneys to help decide whether they should file for chapter 7 or 13 bankruptcy. For the best solutions and experienced legal assistance, the foreclosure lawyer at Consumer Action Law Group help homeowners to stop foreclosure through the courts. 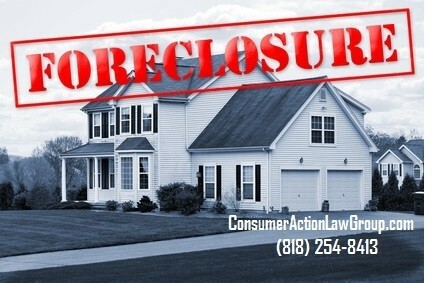 For detail information about their service, visit ConsumerActionLawGroup.com or Call (818) 254-8413.